Twenty years later, when my parents had reached middle age, their arrogance betrayed them and took away their self-respect. In 1956 power shifted in the Kremlin, and my parents along with the rest of the progressive left discovered that the socialist future they had served all their lives was a monstrous lie. They had thought they were fighting for social justice, for the powerless and the poor. But in reality they had served a gang of cynical despots who had slaughtered more peasants, caused more hunger and human misery, and killed more leftists like themselves than all the capitalist governments since the beginning of time. After Stalin’s death, it was the confrontation with this reality, and not Senator Joe McCarthy’s famous crusade, which demoralized and destroyed the old Communist guard in America. I was seventeen at the time, and at the funeral of the Old Left I swore to myself I would not repeat my parents’ fate. I would never be loyal to a movement based on a lie or be complicit in political crimes; I would never support a cause that required the suppression of its own truths, whether by self-censorship or firing squads or political smears. But my youth prevented me from comprehending what the catastrophe had revealed. I continued to believe in the fantasy of the socialist future. When a New Left began to emerge a few years later, I was ready to believe that it was a fresh beginning and eager to assist at its birth. For a long time I was able to keep the promises I had made. As an activist and writer in the movement of the Sixties, I never endorsed what I knew to be a lie or concealed what I knew to be a crime. I never stigmatized a dissenting view as morally beyond the pale. At the same time, however, I closed my eyes to evidence that would have shown me the left had not really changed at all. Like the rest of my radical comrades, I welcomed Castro’s triumph in Cuba, which he proclaimed a revolution of “bread without terror” and “neither red nor black but Cuban olive green.” When Castro established his own dictatorship and gulag and joined the Soviet axis, I too blamed his dereliction on the anti-Communist phobia of the United States, and I averted my eyes from the truth. A decade later, when the Vietnam War came to an end, there was a massive exodus from the New Left by those who had joined its ranks to avoid military service. I stayed. I had never been eligible for the draft and had joined the movement in order to serve the progressive ideal. In 1974 I began a new project with the Black Panther Party, which the New Left had identified in the Sixties as the “vanguard of the revolution.” I raised the funds to create a “Community Learning Center” for the Panthers in the heart of the East Oakland ghetto. The Center provided schooling and free meals to 150 children, and community services to an even larger number of adults. The following year the woman I had hired as a bookkeeper for the Center was kidnapped, sexually tormented, and then brutally murdered by my Black Panther comrades. When I first discovered what had happened, I was paralyzed with fear, a fear that grew as I learned about other murders and violent crimes the Panthers had committed – all without retribution from the law. At the time, the left saw the Panthers as a persecuted vanguard, victimized by racist police because of their role in the liberation struggle. The Panthers’ leader had found refuge from several criminal indictments in Castro’s Cuba; the Party’s spokesmen appeared regularly at progressive rallies to agitate against capitalist “repression” at home. In the eyes of the left, the Panthers were what they always had been: an embodiment of the progressive idea. To defend them against the “fascist” attacks of the police was a radical’s first responsibility and task. In reality the Panthers were a criminal gang that preyed on the black ghetto itself. With the weapons they had justified as necessary for “self-defense” against “racist authority,” they pursued various avenues of criminal violence which included extortion, drug-trafficking and murder. Not all the murders they committed had a monetary rationale. Some were merely gratuitous, as when they killed a leader of the Black Students Union at Grove Street College in Oakland because he had inadvertently insulted one of their enforcers. The Oakland police were aware of the Panthers’ criminal activities; but were rendered powerless to stop them by the nationwide network of liberal and radical Panther supporters who sprang to their defense. With community fronts like the school I had created, with lobbyists in the state house and activists in the streets, with million-dollar defense funds and high-powered attorneys, with civil liberties organizations ready with lawsuits and witnesses ready to perjure themselves, the New Left provided the Panthers with an Achilles Shield that protected them from the law. All the celebrated “Cointelpro” programs of the Nixon White House and the anti-subversive campaigns of the FBI, all the alleged wiretaps and infiltrations of the Panther organization, could not provide the means to sustain a single legal conviction against the Panthers for their crimes, or prevent the 20 or more murders they committed, including that of the woman I had hired. During a decade of radical protest as reckless in its charges as it was indiscriminate in its targets, the left had made civil authority in America so weak that the law could not punish ordinary criminal acts when committed by its progressive vanguard. Because of what I knew, I myself now lived in fear of the Panther terror. In my fear, it became impossible for me not to connect these events with the nightmares of the radical past. Just as Stalin had used the idealism and loyalty of my parents’ generation to commit his crimes in the Thirties, so the Panthers had used my generation’s idealism in the Sixties. My political odyssey had come full circle. When I was beginning, I had promised myself that I would never be silent when confronted by such misdeeds; that I would fight within the left for the same justice as the left demanded of the world outside. But now I discovered that I could not keep my promise and remain a part of the movement I had served. Because a progressive vanguard had committed the crime, my duty as a progressive was to defend the criminal. As a result, the left suddenly became a hostile terrain for me. I had already been threatened by the Panthers to keep silent about what I knew. The facts I knew would not be conclusive evidence in a court of law; but they posed a threat to the Panthers’ political shield. If their criminal acts were exposed to the left, the Panthers might lose their protection and support. But even if I told what I knew, the Panthers might have little to fear. The whole history of the radical past, from Trotsky on, warned that my individual truth would have little effect on the attitude of the left. Confronted by such a truth, the left would seek first to ignore and then to discredit it, because it was damaging to the progressive cause. At the murdered woman’s funeral, I had approached her daughter, who was 18 and a radical like me. On the way to the graveside, I told her that I was convinced the Panthers had killed her mother. The daughter’s grief for her mother was great, but so was the solidarity she felt for black people who were oppressed and for their revolutionary vanguard. When later she was asked publicly about the tragedy, she said that as far as she was concerned the Panthers were above suspicion. To suggest the contrary was racist. What the daughter of the murdered woman did was “politically correct.” I knew at the time that if I were to step forward and publicly accuse the Panthers of the crime, I would be denounced by my own community in the name of the values we shared. All my previous life of dedication and commitment to the radical cause overnight would count for nothing. My own comrades would stigmatize me as a “racist,” shun me as a “renegade” and expel me from their ranks. My dedication to the progressive cause had made me self-righteous and arrogant and blind. Now a cruel and irreversible crime had humbled me and restored my sight. I had started out with others of my generation confident that we were wiser than our parents and would avoid their radical fate. But all our wisdom had been vanity. I could no longer feel superior to the generation that had been silent during the years of Stalin’s slaughters. The Stalinists and the Panthers may have operated on stages vastly different in scale, but ultimately their achievements were the same. Stalin and the Panthers were ruthless exploiters of the radical dream; just like our forbears, my comrades and I were credulous idealists who had served a criminal lie. Through this microcosm I saw what I had failed to see 18 years before, at the time of “de-Stalinization,” when the New Left was born. The problem of the left was not Stalin or “Stalinism.” The problem was the left itself. Although the Panther vanguard was isolated and small, its leaders were able to rob and kill without incurring the penalty of law. 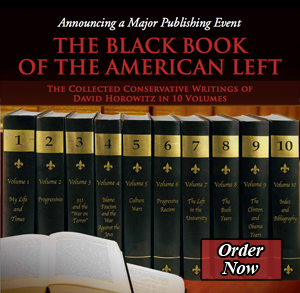 They were able to do so because the left had made the Panthers a law unto themselves – the same way the left had made Stalin a law unto himself – the same way the left makes Fidel Castro and the Sandinista comandantes laws unto themselves. By crowning the criminals with the halo of humanity’s hope, the left shields them from judgment for their criminal deeds. Thus in the name of revolutionary justice, the left defends revolutionary injustice; in the name of human liberation, the left creates a new world of oppression. The lesson I had learned for my pain turned out to be modest and simple: the best intentions can lead to the worst results. I had believed in the left because of the good it had promised. Now I learned to judge it by the evil it had done. This article appeared in The Village Voice, September 30, 1986. Years later Betty’s daughter, Tamara Baltar, came to the conclusion that the Panthers had murdered her mother. With the help of friends, to investigate the case she had hired a private detective who had worked regularly for leftwing defense attorneys. His report concluded that the Panthers were responsible for the murder of Betty Van Patter.